RemARKables Pinworthy Tour: Eggstra Creative – Ideas for Easter! Welcome to this months Pinworthy Blog Tour with the RemARKables! Each month we feature a new theme. You'll be able to visit our Pinterest Pages to see additional ideas and more that we pin throughout the month so you'll want to make certain to "Like" my Pinterest Page and especially my "RemARKables Pinworthy" board. I think you'll enjoy this new format and find plenty of inspiration for our current theme – Eggstra Creative – Ideas for Easter! So, welcome to the March 2014 Pinworthy Blog Tour with the RemARKables! Eggstra Creative – Ideas for Easter! I'm so excited to be sharing some fun cards and projects. The first project is a Clean and Simple Tag A Bag Gift Box featuring product from the Stampin' Up! Pretty Packages line. You'll find that it is a very easy box project to create that will just WOW your socks off! For the second project, I feature a clustered technique often found on Scrapbook Pages but becoming more common on handmade cards. The third card is a cute, whimsical card featuring the Fringe Scissors and Banner Punch. The card base is Whisper White cardstock layered with Bermuda Bay Card Stock and the top layer is Whisper White stamped using the Off The Grid using Smoky Slate Classic Ink then I used the Gorgeous Grunge Stamp Set to stamp several different images using Island Indigo, Bermuda Bay and Pool Party Classic Ink. 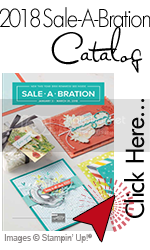 The banners are stamped in Bermuda Bay using the Sale-A-Bration Banner Blast Stamp Set. The arrow is stamped using the Peachy Keen Stamp Set and stamped with Island Indigo Classic Ink. The bunny image is from the Eggstra Spectacular Stamp Set from the Occasions Catalog. I confess that the base layer was prestamped for a card front swap but then my son had to take 20 years off my life when he managed to get into some of my craft supplies and drink some Stampin' Mist which meant a majority of my day was spent on the phone with Stampin' Up! and Poison Control. Thankfully, he showed no symptoms and was actually asking for food along with eating just fine. There was also a huge wet "soapy" spot on the floor so even though he told me he drank some I'm not 100% certain he did or more likely he found out it didn't taste all the good after having a "sip." This second card is fun and whimsical featuring four little bunny rabbits in a row watching the clouds and sun! The card base is Whisper White layered with Pistachio Pudding and a top layer of Whisper White card stock with clouds stamped using Soft Sky Classic Ink and the Create a Cupcake Stamp Set. The bunny rabbits are stamped using the Eggstra Spectacular Stamp Set and to get the individual bunnies, I used a Stampin' Marker in Soft Suede to color only that portion of the stamp set. The Sentiment in the bottom corner was also inked using the Strawberry Sluch Stampin' Marker. I created the sun by stamping with So Saffron Classic Ink using the Chevron Oval image from the Oh, Hello Stamp Set then using the 1 3/4" Circle Punch I punched out a partial circle with the suns rays created from the Banner Punch. The grass is Pistachio Pudding card stock cut to a 1 1/2" strip and using the Fringe Scissors to create the appearance of grass. To finish off the card, I attached and tied a bow using the Blushing Bride Chevron Ribbon. So, one of my absolute FAVORITE Easter Treats are PEEPS! I'll even admit that I prefer they be a few days old… Yes, I prefer stale PEEPS. The inspiration for this project actually comes from a Convention Make & Take. I had the box in the Make & Take kit that I hadn't put together. (Maybe I should mention that Convention was back in July 2013!!!) I knew I wanted to put the Peeps in the box and then I decided to go ahead and use some of the supplies included in the Make & Take but add my own personal touches. The Box starts with the Tag A Bag Gift Boxes. Then I have a piece of Bermuda Bay Card Stock folded to fit over the top of the box like a cover. Using the Stamp-A-Ma-Jig, I lined up the Eggstra Spectacular stamp set to be in the bottom right corner. The Eggstra Spectacular image is stamped using Bermuda Bay for a tone-on-tone technique. On the outside of the plastic cover, I stamped the banners using the Sale-A-Bration Banner Blast Stamp Set and punched out each little banner using the Banner Punch. As a cute little touch, I added a small heart which I punched out of Blushing Bride card stock using the Owl Builder Punch. For the finishing touch, I tied the Blushing Bride Chevron Ribbon around the box and tied it with a bow. Sweet, simple and a fun box perfect for Easter Treats! I invite you to pin any of my creations to Pinterest and to share your thoughts or questions by leaving me a comment. I love hearing from all my readers! To continue on with the next blog on the Pinworthy Blog Tour, you'll want to visit Jeanette Swain! I'm certain you'll enjoy the projects she has to share with you! To view her blog, you can click on her name or on the Pinworthy Button. 12 Weeks Of Christmas for Newsletter Subscribers!